While attending Charlestown High School Pirate and Lady Pirate athletic events, don’t forget to enter for chances to win fan contests , held during the game. 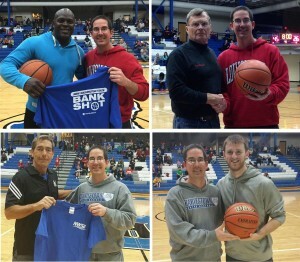 Here are a few of the recent winners of the New Washington State Bank Halftime Bank Shot Shootout and the Backyard Staycation Game Ball winners. December 9th Mo Smith won $50.00 by hitting a layup, free throw and a three pointer in 30 seconds; and Vic Corfiage won the game ball. December 20th Kevin Khuri won $50.00 by hitting a layup, free throw and a three pointer in 30 seconds; and Donnie Roark won the game ball. Shown in the photo from upper left clockwise, Mo Smith, Vic Corfiage, Donnie Roark and Kevin Khuri; all with presenter Ricky Romans, the Pirate Baseball Head Coach. Congratulations to these fans and thanks for playing while supporting Pirate and Lady Pirate athletics.